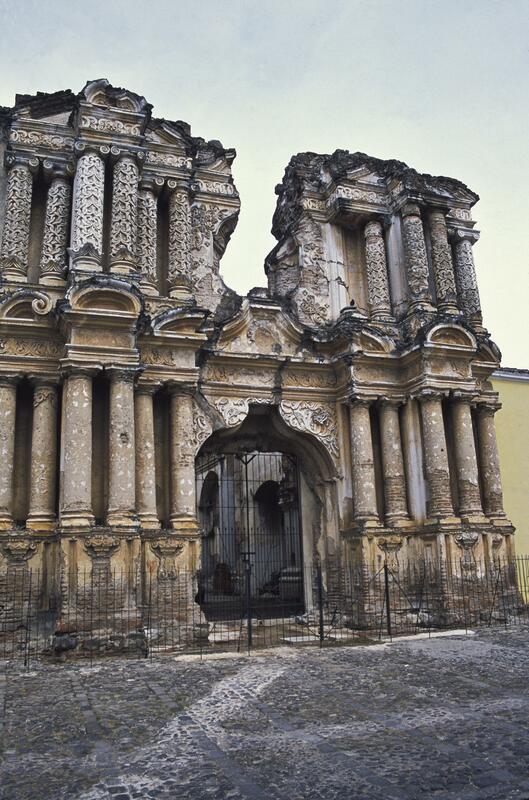 Largely destroyed in the earthquake of 1773, El Carmen still retains its elegant façade. It features pairs of ornately sculpted column and the deep spaces behind them create dramatic shadows in Antigua’s tropical light. Such ornamentation is typical of “Guatemalan baroque,” as the ornate style of Antigua’s 18th-century churches has come to be known. The 1773 earthquake caused vaults inside the church to collapse. But piers and much of the façade remained. Despite its ruinous state, El Carmen betrays its former beauty. Carmelites had particular devotion to Our Lady of Mount Carmel and her statue once appeared in the eight-sided niche set above the main door. Elaborate stucco decoration was applied to the top pillars of the façade, as if covered by three-dimensional brocade. The brick used in construction can be seen in the lower piers. The church was never rebuilt—indeed, the futility of rebuilding so much of Antigua led to the relocation of the capital city in 1776 to the current site of Guatemala City. Modern dwellings have been built where the convent for Carmelite nuns originally stood, abutting the church. El Carmen was founded by the order of Carmelite nuns, a group that helped foster the growth of other religious orders in Antigua. As with many of Antigua’s churches, the names of the architects are not known, but they were most certainly men who were aware of local tastes and thus contributed to Guatemala’s distinctive style of building. Brick and stone rubble were the main building materials in Antigua’s churches. These were covered with a thick plaster coat. 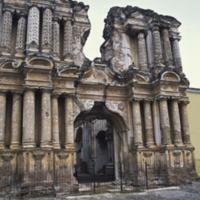 Some of Antigua’s ruins still bear traces of red and yellow paint, evidence that façades like these were once brightly painted. In the 18th century, Antigua was one of the most vibrant cities of Spanish America, the richest and busiest city in Central America by far. Bordering its main plaza was a cathedral and ayuntamiento (city hall). Nearby stood a university. Dozens of churches, convents and monasteries occupied Antigua’s city blocks. El Carmen was one of many architectural projects undertaken by local residents. The number of monasteries and convents that Antigua held was a source of pride for many of its residents. It was a signal of the collective piety of the community, as well as its prosperity. Convents like El Carmen could not operate without well-heeled families who could pay for their daughters to enter and to help support the convent. The dependence of religious establishments on local families was thus an intimate and on-going one in Spanish America. Amerlinck de Corsi, María Concepción. 1981. Las catedrales de Santiago de los Caballeros de Guatemala. Mexico City: Universidad Nacional Autónoma de México. Markman, Sidney David. 1966. Colonial Architecture of Antigua Guatemala. Philadelphia, Pennsylvania: The American Philosophical Society.